On Monday, February 25th, 2019, we celebrated our success in bringing 25 MW of clean solar energy to Sysco, the global food service distribution company. Our Renewable Select program supports 10% of their electricity usage and puts them halfway towards their goal of 20% renewable energy by 2025. In an effort to learn more, we sat down with Lynda Clemmons, Vice President of Sustainable Solutions, and Bradford Pete-Hill, Director of Structured Solutions, two vital team members who brought Renewable Select to life. We wanted to hear, in their own words, what attracted them to the energy industry, what they find valuable about our sustainability projects—and what they expect to see change in the renewables market. NRG: How did you arrive at your current career in the energy industry? Lynda Clemmons, Vice President of Sustainable Solutions(LC): I’ve been in banking, insurance and consulting, but always connected to the energy industry in some way. Historically I worked in the financial segments of those markets, trading with large companies who were transacting on behalf of their own book of business. It was fun and fast paced, but I didn’t feel like it was solving a problem or creating a better world. Now at NRG, I have the chance to talk to customers and find out what they really need and create solutions that are good for the customer and good for the environment. Bradford Pete-Hill, Director of Structured Solutions(BPH): I have been fascinated with the generation/use of electricity since childhood, because of its ability to improve the quality of life of others and connect civilizations on a local/global scale. Throughout out my career I have worked in regulatory, energy efficiency, infrastructure and renewable energy capacities which have expanded my interest and broad understanding of the energy industry. NRG: Having consulted with many Fortune 500 companies on their sustainability goals, what do you think is a critical factor of success to meeting and achieving those goals? LC: Commitment and communication – throughout the organization – of what the goals are, why they matter and when they need to be achieved. Top down or bottom up, either approach can work as long as the goals are straightforward, and the rest of the organization is engaged. BPH: The key to meeting and achieving corporate sustainability goals is not only the act of setting them, but also developing a strategic roadmap as to how to achieve them. A roadmap provides milestones to strive for along your sustainability journey to keep your initiatives focused. Another key to achieving your sustainability goals is having long-term strategic partners like NRG whose resources you can leverage to progress your efforts forward at a consistent pace. 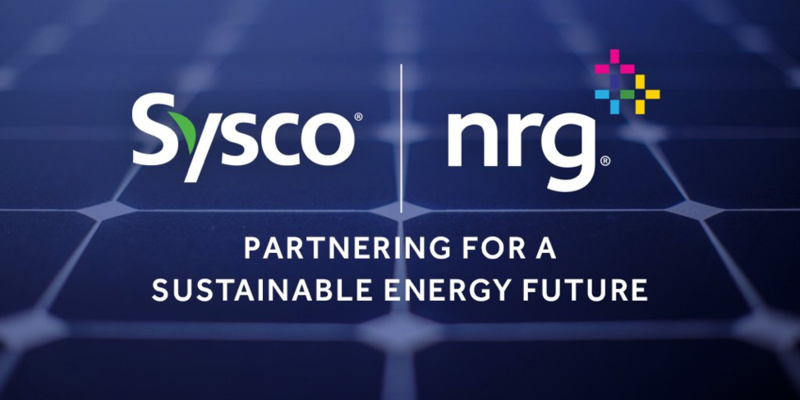 NRG: What does it mean for you to get to work with a team like Sysco to roll out the first of its kind product like Renewable Select? LC: Renewable Select takes a complicated transaction and makes it simple — I’m proud that we are able to help Sysco in moving toward their goal of renewable energy, without them having to assume construction risk or a lengthy contract negotiation. NRG: What are the key trends you are seeing around Renewables in the different energy markets (i.e. cost-effectiveness, long-term energy plans, etc.) and how does Renewable Select solve for that? When we speak to customers, that’s what we hear as prevailing concerns that we can help solve for. NRG: Why does this solution work for Sysco? What was so special about this project with Sysco and what should prospective customers know about it? BPH: This solution worked for Sysco because it was cost-competitive, 100% renewable, and simple for energy and non-energy stakeholders to understand all the mitigated risks. Plus, this transaction took less than 45 days to complete. That is astonishingly fast as compared to the V/PPA negotiation process which can last 6 months to a year - if ever completed at all. BP: Trust and collaboration. There was a great deal of trust built between the two teams which led to intense collaboration in working to find the best solutions for Sysco. Trust and collaboration are paramount for success.